George Rackham informed the Public, 8th June 1850, that the Hotel was now open, elegantly Furnished and offered extremely moderate charges. An Ordinary to be provided every day at Half-past Two o'clock. Fish and Joints 2s each. The Well-made Furniture for 9 Sitting-rooms and 13 Sleeping-rooms, Bar Utensils, Plated Goods, Kitchen and Store-room Articles and a few Choice Paintings, also furniture throughout the Premises were offered for sale by auction Thursday and Friday 3rd and 4th November 1853. House then in occupation of Mr. George Rackham. Offered for sale by auction Thursday 26th August 1858. "Art has been joined to nature in the splendid Marine Drive, 100 yards of which are already made and a further 1000 yards are under construction. At right angle stand the newly erected Wellington and Britannia Piers. 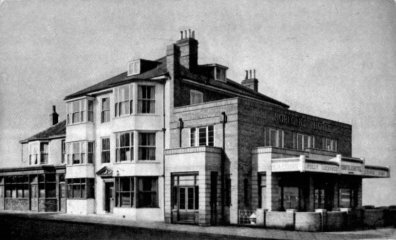 The Hotel commands an extensive view of the sea from Lowestoft Ness to the Cockle Gateway. In excellent repair and well supplied with water from the Yarmouth Water-works Company. There is sufficient space for several more bed-rooms"